Book Review: Going Vintage by Lindsey Leavitt - Book.Blog.Bake. I don’t normally use this word to describe books, but here it is: cute. This book is cute, and it’s the best word I can come up with to describe my final impression of this story. It’s not going to go on a “this-is-my-favorite-book-ever-list”, but it will go on my “read in case of bad day list”. It’ that kind of book. Mallory can be an incredibly dramatic character at times, but she’s the type of character who knows how dramatic she’s being. This makes her behavior, like the obsession with the list, endearing and outlandish in a fun way instead of whiny and obnoxious. It’s hidden behind a lot of fun, but Mallory really does learn a lot through the course of the story. Even as she realizes the golden moral we all know the story will get to eventually, that the list won’t solve all her problems and being a teenager is hard whether in 1962 or 2012, she grows in many more subtle ways as well. One of the things I liked most about this book is how none of the characters come across as being one dimensional. Even Jeremy, Mallory’s ex-boyfriend, doesn’t come across as a villain. He’s definitely a jerk at times(cheating with a girl online tends to get you stuck with that label), he realizes his mistakes and all in all, acts like a believable human being. I absolutely loved Gina, Mallory’s younger sister. Mallory has such a great relationship with her sister, even through their arguments, and it’s nice to see a sibling relationship presented so positively. They’re great friends and are there for each other(for the most part). Gina even agrees to help Mallory with the list. I love the idea of lists that runs throughout this book. I”m a list-maker too, so I always appreciate it when they play a feature in a story. Of course, the grand The List of 1962 in the focus of the story, but Mallory makes lists constantly, and it seems like there’s one almost every chapter. I think, more than anything, is what really gave me insight into Mallory’s character. At first, she doesn’t have a lot of self-identity outside of Jeremy, so the list were a way for me to connect with her as she grew as a character and, as the cliche goes, found herself. Also, the Oliver, the “cute pep-club president”, is a wonderful character. He’s probably not the type of male character you expect to find opposite the main character in most young adult stories, but Mallory’s not your typical narrator, and I love the way the two play off each other. It’s so different and unique and a little eccentric, which I think is one of my favorite parts of the book. Mallory is a bit quirky and vintage, and it gives the whole story a very fun, organic feel. Final Impression: Going Vintage was cute, fun, and a little quirky. Even though Mallory could be dramatic at times, she was charming as were most of the supporting characters. There’s a lot of fun in this book, but there’s a pretty good theme running underneath it all. It’s the perfect book to read as a pick-me-up type of read. 4/5 stars. 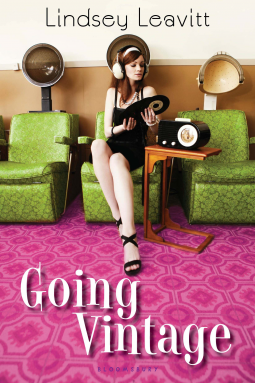 You can find Going Vintage on Amazon, Barnes and Nobles, or the Book Depository. Book Review: The Last Best Kiss by Claire LaZebnik - Book.Blog.Bake. The Sunday Wrap-Up(5) | Book.Blog.Bake. When you see the cover, you just know cute will have to be mentioned in the review! Seems like a light, fun read. Exactly what you need sometimes. Love the list making. Cute is definitely the perfect word to describe it! It had its drama but it was still light and funny and witty. I think as long as you go in thinking this is just a cute, fun read & don’t expect too much, you’ll probably like it(hopefully)! The lists were definitely the highlight of the book. Hope you enjoy!